The practice of using a string setting for jazz instrumentalists is one that is often pompously decried by some of our more serious jazz critics as being almost sacrilegious. This purist approach is probably arguable on aesthetic grounds, but it happens to be an attitude that displays an ignorance of two of the most basic problems facing the jazzmen today. 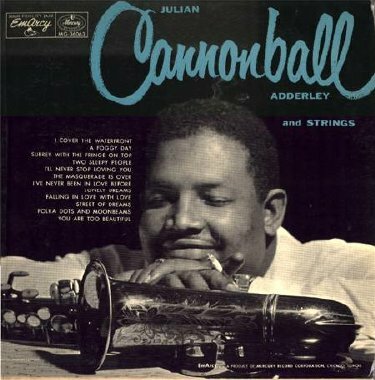 One of these problems has to do with the jazz musician's ever-present need to extend the range of his expression, Certainly, then, anyone with as great a lyrical gift as Julian "Cannonball" Adderley, for example, has every right in the world to take advantage of any opportunity to give his improvisational explorations as broad a vista as possible. And this leads directly into the second problem. The audience for jazz, while ever growing, is still relatively small, and the jazzman, like all creative artists, wants to reach as large an audience as can be reached. What better way then, than through a tasty selection of fine standard popular songs using a rich and skillfully arranged string setting? The tunes chosen for this date are especially noteworthy. Aside from the plaintive Lonely Dreams, an original written by vibraharpist Terry Gibbs, all of these selections are familiar, but not overworked standards. I Cover The Waterfront, a long time favorite of jazzmen, was written by Johnny Green and Edward Heyman in 1933, inspired by the then popular Max Miller novel; A Foggy Day, of course, is the 1937 George and Ira Gershwin classic from the Fred Astaire movie, "Damsel In Distress"; Rodgers' and Hammerstein's Surrey With The Fringe On Top stems from "Oklahoma"; Two Sleepy People, which Bob Hope first sang to Shirley Ross in the movie "Thanks For The Memory" in 1938 was written by Frank Loesser and Hoagy Carmichael. Loesser is also responsible for I've Never Been In Love Before from "Guys and Dolls"; Rodgers and Hart are represented with two songs, You Are Too Beautiful from the 1932 film, "Hallelujah, I'm A Bum" and Falling In Love With Love which was one of the hits from the Broadway musical, "The Boys From Syracuse" in 1938. Another picture tune is I'll Never Stop Loving You from the 1955 Doris Day bio-pic of Ruth Etting, "Love Me Or Leave Me." Nicholas Brodszky and Sammy Cahn are the writers. Polka Dots And Moonbeams is a Burke and Van Heusen opus dating back to 1940; Street of Dreams was written by Victor Young and Sam Lewis in 1932 and The Masquerade Is Over was a 1938 hit by Herb Magidson and Allie Wrubel.